Yes, the DX world is still using paper QSL cards. There are two ways to exchange cards. First, the ARRL outgoing QSL service. Read about it here: http://www.arrl.org/outgoing-qsl-service. The cost is $1.15 per once (minimum $8.15 for <1 oz.) plus $7.00 service fee. See the ARRL web page to download submission form. But what if the Country has no bureau? Many don’t and are listed in the Operating Manual. So then, if you really need the card, QSL direct with a SASE and “green stamps.” To insure (as much as you can) that the card and money reaches the DX, hide the money, and address the envelope with name only, no call. 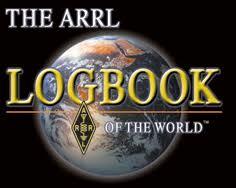 ARRL’s Logbook of the World (LoTW) is becoming more and more popular. I have experienced a 40% return overall since 1975. The return rate was relatively low in the early years, 75% return rate over the past five. But if you use Club Log and OCRS (Online Card Request System.) you should expect a return rate 99%. Use for general QSO’s, working DX, casual participation in contests. Program includes PSK31 utilities similar to DIGIPAN. Program with other digital utilities to work new modes. Program where MMTTY RTTY engine will integrate into program. Uses onboard and/or off board sound card(s). Print labels and manage QSL cards. Output in .adi format to submit to LoTW and Club Log. I use DX4Win and have done so since it first became available. The following shows a general layout. However being Windows based, the layout options are infinite and completely dependent upon the whims of the user. Your electronic logging package will have a means (one way or another) add the QSO's from your paper log, to the electronic log. You will want to do this and, if you can, submit your entire QSO record to LoTW. No way around it, this is drudgery one way or another. I used "Basic Log Import" which seemed easy enough. This Freeware program is no longer shown on the Internet. But I have it and will send it to any requestor. Email me at K5NOF@ARRL.net . Request a certificate for your call-sign. Load your certificate (TQ6 file). Sign and upload your log files. On-line Card Request System (OCRS) is almost a sure way to obtain a QSL. Most rare entity operators use the system. Some simply post a link on their web page to show if you are in their log and if so, a utility to request a QSL and a link to Pay-Pal to pay for it. Normally the cost is about the same as a SASE, international postage stamp and "green stamps" and far more secure and reliable. To get started, visit https://clublog.org/loginform.php. You will be greeted by a screen that looks like this. Register and then "click around" to see all the features offered by this great utility. 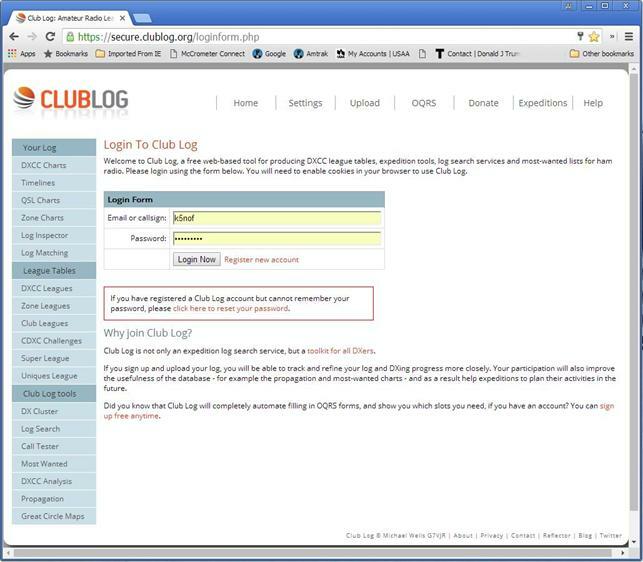 Upload your log in .adi format to Club Log and then update your Club Log record periodically. Use the same .adi files you upload to ARRL to update your LoTW record. Dave Moore (N7RF) reports there is a new FT8 Beta version (Ver. 1.9.9-rc2) being tested. It’s for DXpeditions and it allows them to work multiple stations very rapidly with multiple response channels. This is definitely needed. The Beta tests will be outside the normal FT bands and will be conducted by several stateside hams on March 6 & 7 (including Joe Taylor himself).